A police spokeswoman told the North Belfast News they are preparing a file for the Public Prosecution Service on matters relating to breaches of the Parades Commission’s determinations in July. The Orange Order Twelfth parade past nationalist homes on the Crumlin Road breached a series of the Parades Commission rulings. 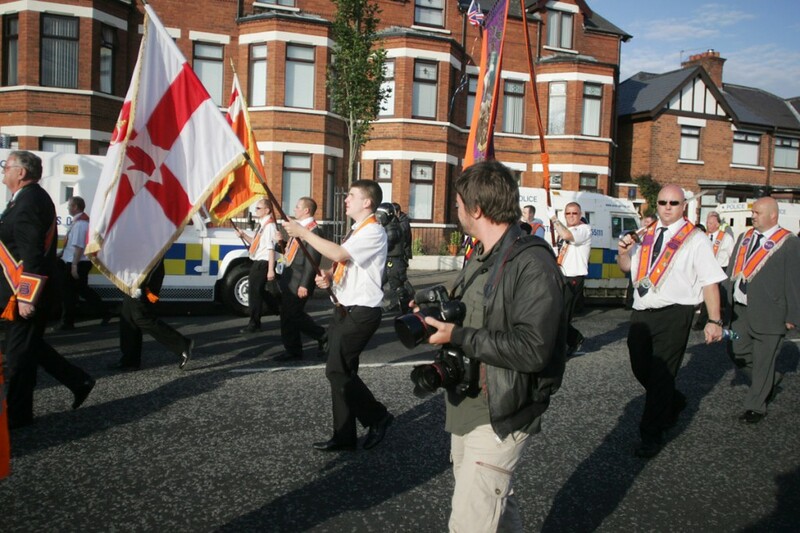 The body had ruled that marchers could go past nationalist homes in Ardoyne but that no music, including a drum beat, was to be played, that flags must remain furled and no bannerettes could be on show at that that stage of the march. After an eleventh hour U-turn the commission ruled the day before the contentious parade that the only flag that could remain unfurled was the union flag, but all other flags must not be flying freely. However, during the morning parade a drumbeat was heard and a massive banner saying ‘Republicanism = Cultural Apartheid’ led the parade. On the return parade a bannerette was displayed and an Ulster flag and Orange Order flag were flying. A Parades Commission spokesman confirmed that they consider the actions of the parade organisers a breach of their ruling and the matter is now in the hands of the PSNI. Joe Marley from local residents’ group, Crumlin and Ardoyne Residents’ Association (CARA), said they want to see action taken. “At the minute we ourselves are currently in the process of taking legal action against the Parades Commission on their last minute U-turn on the same parade,” he said. The Parades Commission has also written to organisers of the Royal Black Preceptory parade and Apprentice Boys parade through the area asking them to explain why they carried the ‘Republicanism = Cultural Apartheid’ banner, which was also a breach of their ruling. A spokesman for the Commission said they will make a decision on whether the banner is an official breach when and if they hear back from parade organisers.